If you have just been diagnosed with diabetes, you may find yourself wondering, what can I eat? Being that diabetes is a disease in which sugar is not metabolized effectively, people with diabetes need to manage and control their carbohydrate intake. Doing so cannot only help to control blood sugars, but can also result in weight loss, a reduction in triglycerides (a measure of fat in the blood), and a decrease in risk for other cardiac risk factors. If you have prediabetes and have been told to lose weight, a calorie and carbohydrate controlled diet can help to prevent and delay diabetes. Research indicates that losing a small amount of weight, about 7-to-10 percent of your body weight can help to reduce your risk of developing diabetes. Some research even indicates that losing enough weight and keeping it off can actually put type 2 diabetes into remission. It's often hard to find the time to search for recipes and create meals that are tasty, and nutritionally balanced. Before searching for meals and meal plans, it is wise to find out how many calories and carbohydrates you need to reach both your weight and blood sugar goals. If you haven't already, set up a meeting with a registered dietitian or certified diabetes educator to get an idea of your ideal caloric and carbohydrate intake that would support your goals. This meal plan was made for people looking to eat an 1800 calorie diet. In it, you'll find, three carbohydrate controlled meals, one snack, and one dessert totaling 1800 calories (approximately 500 calories per meal, dinner is about 600 because it includes dessert and about 200 calories for the snack). For some of you, the total amount of carbohydrates in this meal plan may seem like too much. 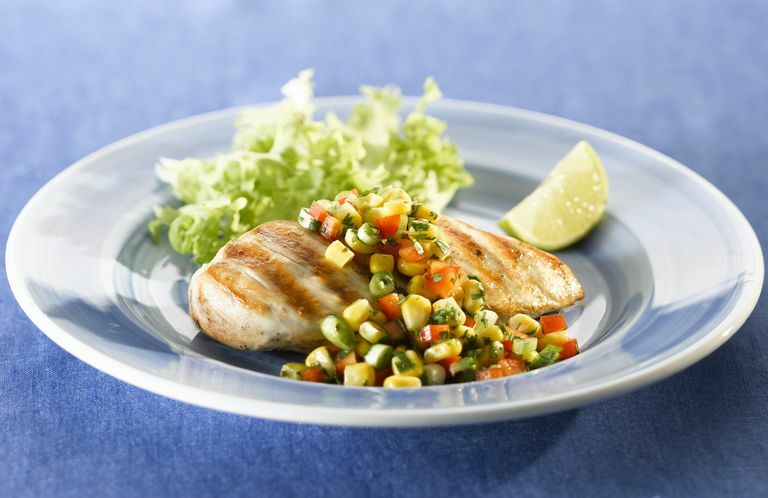 Some people with diabetes benefit from eating a lower carbohydrate diet. A good way to check to see if your meal plan is working for you is to test your blood sugar before and two hours after a meal. Check to see how much your blood sugar has risen two hours after the start of your meal. For most, blood sugars should be less than or equal to 180mg/dL two hours after a meal. Check with your physician for your exact blood sugar targets. Meal replacements, such as smoothies can serve a purpose in losing weight. In addition, they can be protein- and vitamin-rich. When made with the right ingredients, they taste good and are a quick, filling breakfast option. Toss roasted corn, tomato, salad dressing and avocado together while corn is still warm. This will slightly melt the avocado and create a creamier dressing. Chill and serve over lettuce with pita toast on the side. Rub chicken breast with olive oil and sprinkle with black pepper and garlic powder and grill. Place broccoli in a microwave-safe bowl, pour a little bit of water over the top and cover with plastic wrap. Microwave for 60 seconds, or until soft. If you'd prefer not to use your microwave, steam broccoli in saucer pan with a small amount of water. Add a teaspoon of olive oil and garlic powder for flavor. Cook rice as per package instruction and sprinkle with sunflower seeds. Savor the blueberries and dark chocolate for dessert. Spread peanut butter over apple slices (or carrots) or use peanut butter as a dipping sauce. Nutrition information: ~194 calories, 17.1 g carbohydrate, 12.3 g fat, 1.5 g saturated fat, 9.3 g sugar, 7 g protein, 4.1 g fiber. Lean M, et al. Primary care led-weight management for remission of type 2 diabetes (DiRECT): an open label, cluster-randomized trial."Lancet. 2017:DOI:10.1016/ S0140-6736(17)33102-1.